A recent study links e-cigarettes to heart attacks, coronary artery disease, and depression. Researchers from the University Of Kansas' School Of Medicine in Wichita reported that electronic cigarette users are over 50 percent more likely to get heart attacks than nonusers. This should be of significant concern to many people, as there are assumptions that these devices are safer than regular cigarettes. These devices have also become increasingly popular among adolescents, which should further concern people. Electronic cigarettes, shortened to e-cigarettes, are battery-operated devices that produce aerosol by heating a liquid. Most e-cigarette liquids contain nicotine. E-cigarettes are seen as not as harmful as regular cigarettes. They come in varying sizes and shapes. E-cigarettes can resemble cigarettes, cigars, pens, and USB flash drives. They can sometimes also come in a larger device, known as a "mods" or "tank systems." Nicknames for e-cigarettes include "e-cigs" and "vapes." JUUL, NJOY, Vuse, and blu are commonly found brands. Both news outlets and social media have reported extensively on teenage use of the e-cigarette brand JUUL. This specific brand has become very popular among high schoolers. It is also the best-selling e-cigarette band in the United States. A JUUL e-cigarette is powered by a reusable battery that resembles a USB flash drive. It heats a liquid that contained in cartridges known as "JUUL pods." One individual JUUL pod is reported to contain as much nicotine as a pack of 20 regular cigarettes. What is Found in E-Cigarette Aerosol? E-cigarette aerosols are not "water vapors" that are innocuous. In addition to nicotine, it contains fine particles that are harmful when inhaled. Another harmful chemical is diacetyl, a flavoring linked to lung disease. Carcinogens, chemicals that cause cancer, are also found in them. They also contain heavy metals including lead, tin, and nickel. E-cigarette labels are also unreliable in what these liquids contain. There are a few e-cigarettes that are marketed as having no nicotine but actually contain it. Nicotine can impact an adolescent's developing brain. The brain usually continues developing until around age 25, meaning that even young adults users of e-cigarettes may experience issues even if they started using e-cigarettes in adulthood. Adolescent use of nicotine may impact parts of the brain that affects attention, learning, mood, and impulse control. Nicotine also affects how synapses are formed in the brain. This can be a significant issue, as brains of younger individuals create synapses faster than older individuals. Adolescents who use e-cigarettes are also more likely to be future cigarette smokers. Conducted by researchers at the University Of Kansas' School Of Medicine in Wichita, the study's data included over 96,000 people who responded to the CDC's National Health Interview Survey. Researchers examined surveys conducted in 2014, 2016, and 2017. The 2015 survey was excluded because there were no questions pertaining to e-cigarettes. This study shall be presented in late March at the American College of Cardiology's 68th Annual Scientific Session in Washington, D.C. Researchers looked at heart attack, coronary heart disease, and depression rates of e-cigarette users and nonusers. Their data showed that the likelihood of having a heart attack and stroke for e-cigarette users compared to nonusers were at 56 and 30 percent respectively. Regarding coronary artery disease, e-cigarette users were 10 percent more likely. 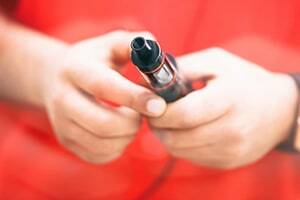 E-cigarette users were 44 percent more likely than nonusers to develop circulatory problems. E-cigarette users were twice as likely to have mental health conditions such as depression and anxiety. Dr. Mohinder Vindhyal, the study's lead author, reported that even light e-cigarette use can still increase the risk of a heart attack or coronary heart disease. These findings are alarming, as vaping has become the most popular way to consume tobacco for teens. Usage rates increased by 78 percent between 2017 and 2018. When the FDA first announced e-cigarette regulations in 2011, only 1.5 percent of teenagers had vaped at that time. E-cigarettes contain fewer harmful chemicals than regular cigarettes. While this may be the case, e-cigarettes are still filled with harmful chemicals. As such, they are still harmful to you and your children's health. How can I Prevent or Help Stop my Child From Using E-Cigarettes? The most important thing you must do to discourage your child from using e-cigarettes to not use tobacco yourself. If you smoke cigarettes or use e-cigarettes, make a conscious effort to quit. Call 1-800-QUIT-NOW. They really can help. Have a talk with your child on e-cigarettes' impact on their health. Start as early as possible, especially if they have not smoked cigarettes yet, but are already familiar with them. Make sure your child knows that you want them to avoid all tobacco products, cigarettes or e-cigarettes.